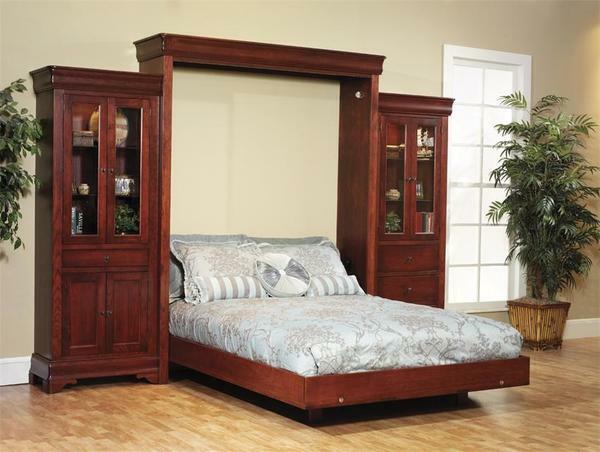 Check out DutchCrafters Premium Amish-made Murphy Wall Beds! Perfect for furnishing a studio apartment. Learn more! Murphy beds are also called wall beds, hideaway beds or vertical beds. Murphy beds do just that - they hide away and allow you to have lots more space in your room. The Murphy bed came into existence around the 1900s for the same reason people have them today - to save space. DutchCrafters Amish Murphy Wall Beds are beautiful and rock solid. These Amish beds are built using only premium solid hardwood and expert Amish craftsmanship. Our Murphy Beds will transform your room with the look of custom cabinetry and then easily become first class sleeping quarters. Our Murphy Beds are available as a twin bed, full bed and queen bed sizes. Not many beds are constructed from solid hardwoods but DutchCrafters is proud to offer superior solid wood Amish furniture! All of our Amish bedroom furniture is top of the line quality construction - held to the highest standards of craftsmanship! We offer our bedroom furniture in a variety of wood types and finishes. After an order is placed we send you out finish samples to confirm your paint or stain selection. Our Murphy Wall Beds are proudly handcrafted in America. Feel good supporting the American economy, and for purchasing furniture built using ecologically-responsible practices when you purchase an Amish-made, American Murphy Wall Bed! Order your Murphy Wall Bed and Companion Bookcases today, and ship all three to your home for the low flat rate! We also offer our Amish Mission Style Murphy Bed if you are looking for more of a craftsman looking Murphy Bed design. We are happy to customize our wall beds if you have a design in mind. Give one of our Amish furniture specialists a call for a custom quote request. 1-866-272-6773. The Murphy Bed ships in 5 pieces which need to be assembled. Detailed instructions are provided. Mounting hardware is also provided.